I’m always on the lookout for great mac and cheese variations. There are so many combos you can make with pasta and cheese and I love them all. Luckily Mike loves them too. It’s funny because before me he used to be allergic to cheese–not crazy stop breathing allergic, but definitely break out in hives allergic. After we started going out his allergy disappeared and I like to think that I was the cure. Whatever the reason, I’m happy that we’re a cheese eating family. 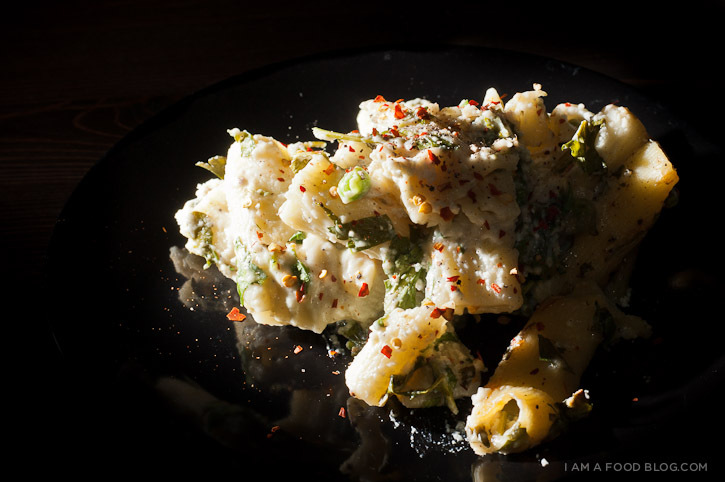 This mac and cheese is a riff on the classic combo of peas and mint. 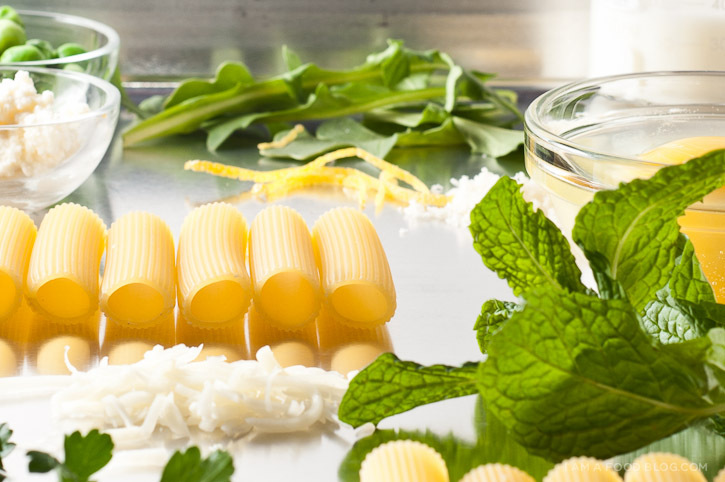 The creamy, cheesy sauce is lighted up with lots of chopped arugula and mint and lemon zest adds a refreshing note that contrasts the richness of the ricotta. 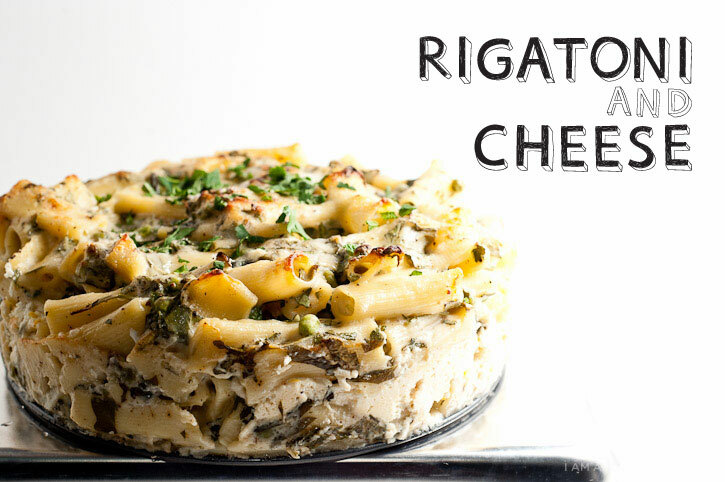 I especially love the bits of rigatoni that get crunchy when baked. I’m totally going to have to create a dish with pasta that’s all crunchy all the time. I am rich, I am fresh: I AM RIG AND CHEESE WITH PEAS & MINT! Heat the oven to 375°F. Butter a pan and dust with 1/6 cup parmesan. In a sauce pan over medium heat melt the butter. Add the flour and whisk for 2 minutes. Gradually whisk in milk and bring to a simmer. Whisk often and reduce heat to medium. Cook until sauce is thickened, about 20 minutes. Remove from heat and stir in Fontina, parmesan and egg. whisk to blend. Season with salt and pepper. Cover and keep warm. Cook pasta until almost al dente. Transfer the pasta to a large bowl and add peas, stir in sauce, arugula, parsley and mint. Mix throughly. Transfer half of the pasta to the pan and top with ricotta and lemon zest. Top remaining pasta. Sprinkle with parmesan and bake for 30-40 minutes or until golden brown. Let rest and sprinkle with remaining parsley and mint. Enjoy! Mmmm… you can’t really go wrong with macaroni and cheese! It looks like you made yours’ in a spring-form pan; makes for a neat presentation! I love it! I first saw this recipe in Bon Appetit.. I looked online for reviews, which is how I found your site. It looked so good that I decided to make it and I added some chili flakes after spotting flecks of red on your photo! My version looked exactly like yours and I followed the recipe as written. But it tasted awful. The ricotta/lemon mix didn’t ‘melt’ into the pasta, t just sat there in lumps. I had expected the rich cheese-iness to be lifted by the arugula, mint and parsley but it just turned out thick, tasteless and unappealing. And it took 1.5 hours to make. I don’t recommend this recipe. 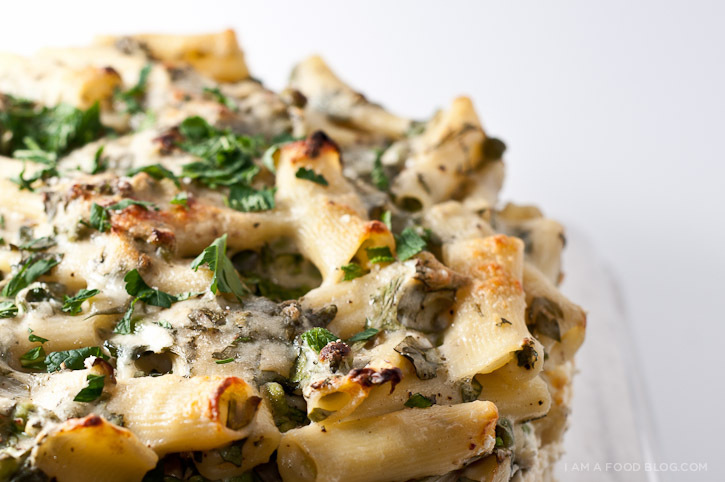 Pasta that’s all crunchy, all the time: I like to do this with penne. Cook some penne until it’s al dente. Then heat a little olive oil in a saute pan. Drain the pasta and put it into the pan with the oil, let it sit for a minute, and then toss it about so it gets properly crispy everywhere without getting burnt. Season it with oregano, basil, red pepper flakes, salt and some parmesan. You can’t really eat it with sauce because it’ll get soft again, but you could eat it with tomato slices, or with tomato slices and mozzarella like a carby Caprese salad or something. because pasta SHOULD be crispy. hi su, i haven’t tried so i’m not sure what the timing would be on it!